Congratulations to Iain who received his Grey Wolf Award at Founder's Day. Iain has worked hard to get his Grey Wolf. The Grey Wolf Award is the highest award in Australian cub scouting. Hopefully we will have many more cubs getting their Grey Wolf this year and in the years to come. 1-2-3-WOOF Iain! 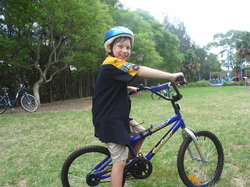 Cubs had a fun day on Sunday 20th February - cycling in Bicentennial Park. Cubs had a great time doing the Time Warp at Cuboree at Cataract Park in January. Waterslides, horizontal bungy and Challenge Valley kept everyone busy!